How to Pass CISA at the First Attempt? Read the ISACA’s CISA review manual, and try to understand each concept. Never try to cram anything—this will not help you in the actual exam. Make notes of your concept in a notebook and review it until you become familiar and confident about the concepts. Once you are confident that you can recall and explain all the basic concepts of CISA exam. you need to start reading “CISA review questions, answers and explanation” ,published by the ISACA. Do not forget to read all the explanations for the wrong answers. Before taking the actual test, allow yourself at least 3-4 months to prepare. If you do not feel confident about the subject matter, allow yourself more time to prepare—there is no hurry since this exam. is offered three times a year. You can easily pass the exam. if you follow the official CISA review manual, but you may need to take help of supplementary materials for clarification of some concepts. Remember that it is not possible for a single book to help you develop clear concept on every topic of CISA test. When you start studying the CISA review questions, never think that you are going to take the test. Instead, think that you are already an IT auditor, and you just have to make the right decision, taking into consideration of your professional code-of-conduct and without violating the assigned authority of an auditor in an IT environment. The hardest part for preparing CISA exam. is to visualize all the concepts, which will be tested in the exam, in your mind. So, prepare some notes of your own so as you can use it as a quick review. Remember: before the exam, you will not be able to review all the materials of CISA review manual. Therefore, you need some short notes to review the exam. topics quickly. Become familiar with the basic concepts that will be tested in the actual exam. Read the review questions manual provided by ISACA. To become familiar with the core concepts of CISA and make it your second nature, you have two options: either make your own notes or collect notes from others. Although you can easily pass the exam. by studying only the official review manual, it is better to have something that you can easily review such as your own notes written in simple words. Remember that CISA will never test how strong you are in IT related systems; they will make sure that if you are competent enough to make decision, to evaluate and to review IT security and audit related issues. 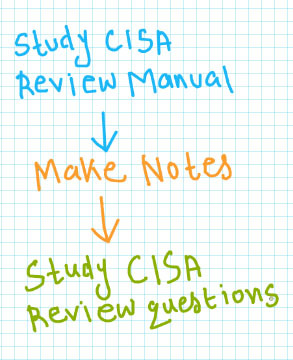 You can have a look at some sample pages of CISA essential exam notes.